My name is Sarah (aka DopeyGirl) and I am SO excited to be your Guide for the DISNEYLAND: Planning Your Disneyland Adventure , DISNEYLAND: Getting There (and Back!) , DISNEYLAND: Staying in Style: The Hotels, DISNEYLAND: Touring the Lands: Disney Parks , DISNEYLAND: Southern California Attractions , DISNEYLAND: Feasting and Snacking: The Eateries, The Porch: Introductions, Countdowns, and Farewells and THE LOCKER ROOM: Sports and Athletics forums!!!! 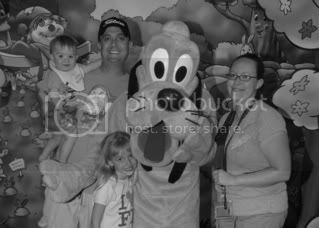 I am a travel planner with Ears To You Travel and a stay-at-home mom to a 15 year old daughter (who is just as much a Disney addict as I am) and a VERY busy 7 year old boy who, in his first year of life alone, spent just over a month at WDW! Needless to say, his brain has been being Disneyfied since before birth! My husband was a proud member of the United States Navy and just ended his service in October 2012. His service had us living up and down the east coast - we started his career in Jacksonville, FL, moved up to Maine, back down to Pensacola, FL and then Virginia Beach, VA! We ended his career at our first WEST coast duty station on Whidbey Island, WA! My family is all on the west coast so it was great to be back close to home after all those years! DH's military duty afforded him the opportunity to travel to Japan, Italy, Germany, Bahrain, England, South Africa, Dubai, Cuba, Curacao, Turkey, Greece (and the island of Crete) among many other places, and his job specialty helped him to grab a great civilian job doing the same thing in Texas, where we live now! I have been a proud member of the PassPorter community since early 2004 and truly do consider this place home and family! I have been fortunate enough to meet and travel to both WDW and Disneyland with many other members of the boards and believe me when I say that everyone here is fantastic!!! I first discovered PassPorter after returning home from a trip to Walt Disney World in December 2003. Since the first time I read PassPorter, I have not laid eyes nor hands on another Disney guidebook! True story! I am a veteran of many, many trips to Walt Disney World (I was stationed in Jacksonville, FL while I was in the Navy in the mid-90's . . . so I made it to WDW at least once a month! ) My first trip was in April 1996! I have also been to Disneyland quite a few times as well! My first trip was in June 1977, when I was all of 8 months old! I was born in San Diego, CA and lived there until I was 12, so we made just a *few* trips north to Disneyland. I love Walt Disney World with all of my heart, but there is just something about “The Original”! I am so proud and excited to be a part of the PassPorter family and hope I can serve you all well! Last edited by DopeyGirl; 02-24-2016 at 02:48 PM.. Reason: updating info!